When you think of your holiday dorm room decor, you most definitely picture your dorm Christmas tree. Your dorm Christmas tree is where you start your holiday dorm room decorating, after all. When you have the vision of your perfect holiday dorm room decor in your mind, maybe your dorm Christmas tree isn't a normal dorm Christmas tree. Maybe you want something a little different than a plain green dorm Christmas tree in your dorm essentials. Maybe you really want to wow and impress your friends by adding some unique pieces to your holiday dorm room decor. 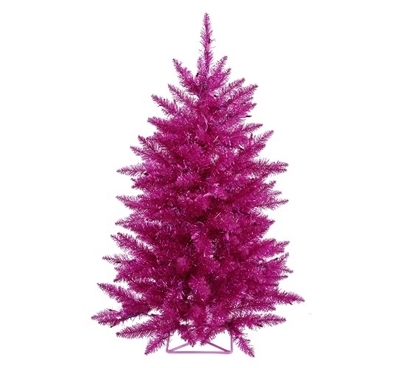 For a unique addition to your holiday dorm room decor, add our 2'x23" Fuchsia Tree with Mini Lights! Our Fuchsia Tree with Mini Lights has pretty fuchsia colored branches that will be a one of a kind addition to your dorm room decorations for the holidays. Placed on the branches are purple mini dorm lights to add extra style to your Christmas decorations for your dorm room decor. You may be really excited about dorm room decorating for the holidays but get worried and overwhelmed when you think about the space available in your small college dorm room. With this dorm essentials item, you don't have to worry about that. Our Fuchsia Tree with Mini Lights is a compact dorm Christmas tree that will work well whether placed on top of a dorm room dresser or in a corner of your college dorm room!